The Salesfundaa CRM software is on a cloudbased platform and its true capabilities are only now beginning to be realized. There are four ways in which the cloud is expected to shape our lives over the next decade and beyond. Cloud is today building the digital infrastructure of tomorrow’s cities. Driverless cars and drone taxis, Smart escalators and parking lots, trains and subways, farms and power plants -- all are safer and better managed, thanks to the cloud’s ability to store and analyze data. An example of technological breakthrough the Salesfundaa CRM software on the cloud has proved to be transformative for companies, especially small and mid-sized businesses, as data analytics, artificial intelligence and other capabilities are available as services. Regardless of industry or size, all companies need digital infrastructure to support their business operations. The Salesfundaa CRM software on the cloud supports emerging technologies such as artificial intelligence and helps them to adapt to new platforms such as mobile. 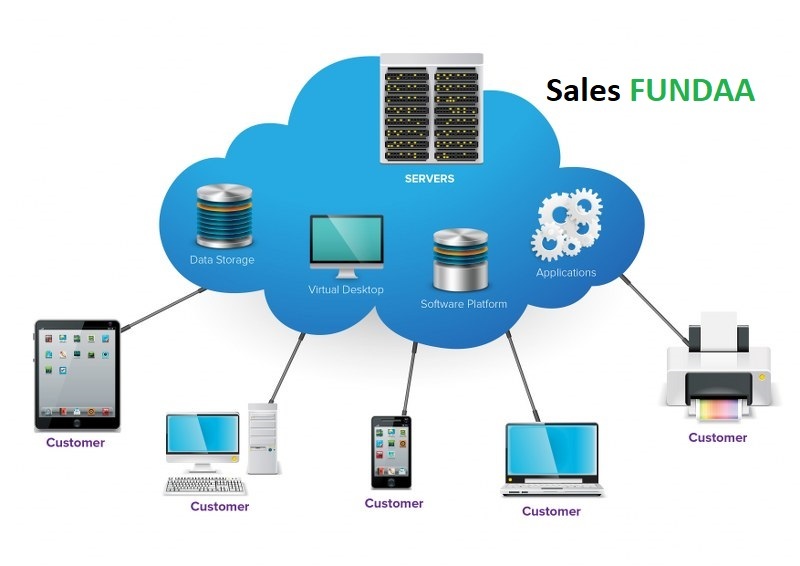 Wide spread adoption of Salesfundaa CRM software on the cloud has become popular as it is secure, accessible and affordable and scalable and has led many vendors to shift focus from on-premise solutions to Salesfundaa CRM software cloud based business management. It is important to understand the platform where the versions are hosted. On-premise software is installed locally, on your business’ computers and servers, where cloud software is hosted on the vendor’s server and accessed via a web browser. Along with accessibility, you also need to consider, cost of ownership, software updates, software ownership and additional services, such as support and implementation when making a decision. Scalability – Its Cloud technologies provide greater flexibility as you only pay for what you use and can easily scale to meet demand. Anywhere and anytime access – You can access your business information anytime and anywhere via a web browser from any device. Affordable – The Cloud version rules out making annual contracts as maintenance and support are included in as monthly costs add over time. Quick deployment–Salesfundaa CRM software which is Cloud-based software is easier and quicker to deploy as all you need is an internet connection and it can be deployed in a matter of hours as compared to an on premise version. Predictable costs – Benefit from predictable monthly payments that cover software licences, upgrades, support and daily back-ups. Worry free IT – The cloud service provider takes care of upgrades and compatibility as it is hosted by them so you don’t need to worry about maintenance of your software or the hardware it resides on. Lower energy costs – When you move to Salesfundaa CRM software on the cloud, you no longer have to pay to power or to maintain the environment. This significantly reduces your energy bills. High levels of security – Data is often safer in Salesfundaa CRM software on the cloud than on a server in your offices. There is no right or wrong answer to the cloud vs on premise software dilemma. Every customer is different with different requirements that will influence the choice of the deployment strategy. We can analyse On premise deployment and closely compare and conclude that….. Since you are only paying for your user licences once, an on-premise solution can have a lower Total Cost of Ownership than a cloud system. With on-premise systems, you do not rely on internet connectivity or external factors to access your software. Your data, hardware and software platforms are all yours. You decide on the configuration, the upgrades and system changes. On-premise systems are comparatively more expensive as the price often includes maintenance costs to ensure support and functionality upgrades. Deployment requires longer time frame due to the need to complete installations on servers and each individual computer/laptop. With an on premise system, buyers are responsible for maintaining server hardware and software, data backups, storage and disaster recovery. This can be an issue for smaller companies who have limited budgets and most importantly immediate technical resources at hand. Which is the right for my business? Capital Expense vs Operative Expense – Can you afford the upfront investment required in an on premise solution? Answer : Yes but if I have an alternative solution. Backup and disaster recovery – Do you have the tools to ensure top level security? The upgrade cycle – Is it important for you to have access to the latest functionality and compatibility updates? Answer: Definitely. That’s upmarket and appeals to the new age performance oriented employee. Besides its standardizes productivity. These are the questions that crop up before finalising your cloud vs on premise software decision: And if your answers match the ones along side you definitely should go in for the Salesfundaa CRM software which is a cloud based version for the convenience of business process. Call us on 9235 35 35 35 for free demo of the Salesfundaa CRM software on the cloud.